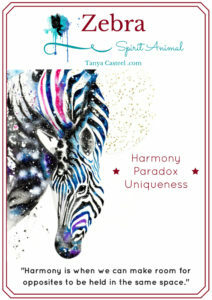 Zebra spirit animal symbolizes balance, harmony, paradox, and uniqueness. Zebra wears the patterns of paradox and opposite forces right on its skin for all to see. Bringing attention to the tension that weaves its way through our universe. This is where true positive magic and power actually lives – where opposites meet, not on either extreme. Zebra lets us know that we don’t have to choose one way or the other. We can embody both at the same time and still hold onto our unique individuality. The full spectrum of emotional and physical differences are needed. Harmony is when we can make room for opposites to be held in the same space. Zebra is part of the horse family so also much of Wild Horse medicine also applies to Zebra. Zebras are safer in numbers. Is there a way you can create a safe tribe or team? Zebras have mohawks! Zebra is a sensitive 80’s badass, a rebellious truth-teller who is committed to being authentic. Zebra rides a wave of inner coolness that could be seen as awkward by others. Really, it’s the shame and jealousy of seeing the inner beauty of someone else shining that makes others feel awkward inside for not being true to themselves – not the other person earnestly expressing themselves. Zebras cannot be tamed or domesticated despite humans’ efforts. Don’t compromise yourself and your values. Be wild, free, and expansive. Don’t let yourself be smaller than you are. When being attacked by a Lion, Zebras can fight back by using their hoof to break the Lion’s jaw. The Lion goes into a slow death due to starvation. Zebra is no victim! Stand up for yourself against hate. Let it be known that hate is not acceptable and silence this shadow so it can’t spread to others. Also, break the jaw of your own inner mean voice. Tell yourself you will only accept loving thoughts about yourself and others. Remember each Zebra has its own unique combination and display of stripes and does not hide them (just like Tigers). Embody and embrace your own unique qualities, interests, and feelings. Make sure you’re also allowing others to express their stripes. No combination or pattern is better than another. Don’t compare yourself to others. Comparison breeds judgment, fear, & hate. Honor and love the way you are meant to show up in this world. There is room for all of us. No more hiding. Zebras are white AND black, representing that we each have light AND shadow within us. Don’t ignore or repress your shadow. Be brave and look at it. What message does it have for you? Where can you transmute your shadows so it can’t harm yourself or others? Panda & Penguin are also excellent at holding paradox. Zebras’ unique striped pattern makes them stand out in a unique way and paradoxically provides camouflage from prey. Their contrasting stripes even have the ability to confuse biting insects, causing them to fly away. What could you do with your (physical or energetic) appearance to stand out, blend in, or deflect attacks? I want to hear about your Zebra experiences. What stories or dreams have you had? Please share and join in the conversation below! Beautiful work! 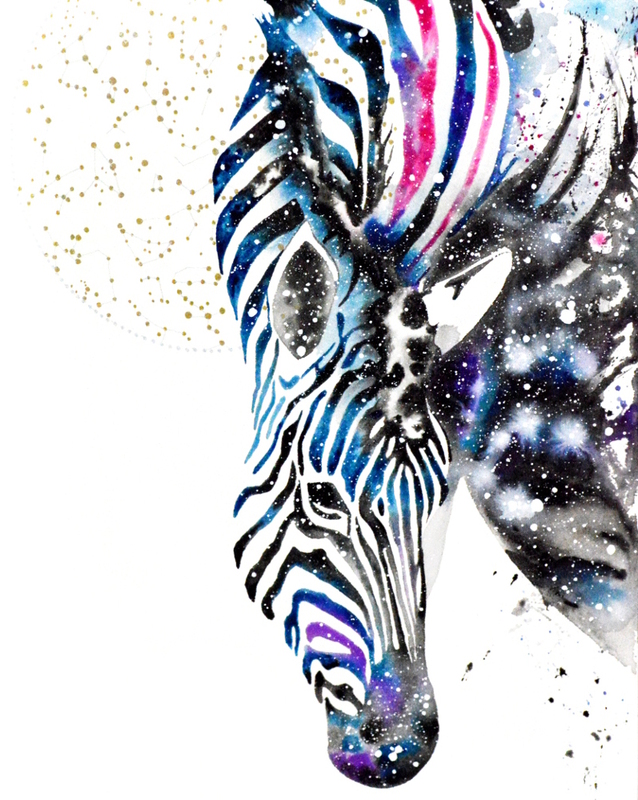 I found you in a google search researching Zebra animal spirt. Love it! !